“New York City is a union town,” they chanted — thousands of voices reverberating off of office buildings and down the upper Manhattan street on Tuesday afternoon. They donned green, carried banners and marched from 6th Avenue and 50th Street to Columbus Circle, determined to make their grievances heard. This was how thousands of union construction workers marked the one year anniversary of #CountMeIn, a rank and file movement grounded in the fight against the developer Related Companies. The battle with Related began last fall when the company refused to sign a project-labor agreement ensuring the exclusive use of union labor with the Building and Construction Trades Council. 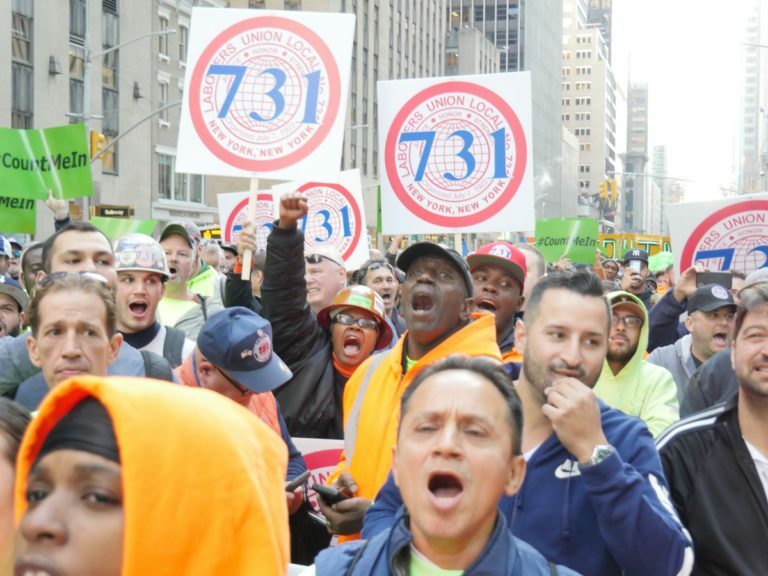 While Related used union labor for the first phase of construction for Hudson Yards, a multi-billion dollar project in Manhattan’s West Side that is set to become the city’s biggest development since the Rockefeller Center, labor leaders criticized the company’s refusal to sign onto the second phase as an attempt to wane the power of collective bargaining in the city. Instead, the developer hired contractors that used an “open shop” model, or a blend of union and nonunion labor, in order to cut costs. Nonunion workers are sometimes paid as low as $15 per hour and receive little, if any, safety training — a huge pay and experience disparity from their unionized counterparts, who can be paid up to $90 per hour including benefits. Then came #CountMeIn. Since the movement’s inception, rank-and-file union members — carpenters, ironworkers, electricians — have held weekly protests in front of Hudson Yards, Related’s offices at Columbus Circle and the NFL headquarters. (Stephen Ross, Related’s chairman, also owns the Miami Dolphins football team.) This past August, several union workers were arrested after demonstrating in front of the NFL Headquarters. Earlier this month, the New York City Council passed a resolution in support of the #CountMeIn campaign. Last May, thousands from Building Trades participated in a #CountMeIn rally at Union Square with Gov. Andrew Cuomo (Building Trades has formally endorsed Cuomo for his gubernatorial reelection bid). Catalina Cruz, a Democrat running for state Assembly in Queens, was also present at Tuesday’s rally. For Kristine Azzoli, a six-year member of Local 1 Bricklayers and Allied Craftworkers, the solidarity bred within #CountMeIn is also a touchstone for the movement’s intersectionality. Over the years, developers have increasingly moved to the use of nonunion labor for urban projects. In particular, the surge of nonunion work for high-rise buildings in Manhattan, an area that once solidly used union labor, marks an alarming shift in development for some labor leaders. Photo: #CountMeIn demonstrators in Midtown on Tuesday. Credit: Twitter/@laborpressNY.